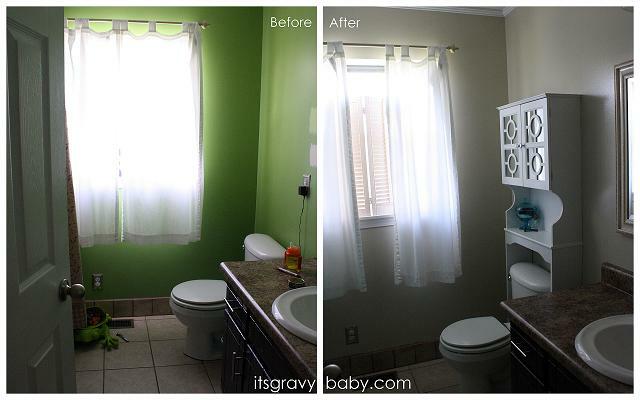 Bathroom Makeover in a Day #GliddenTesters - It's Gravy, Baby! We planned to start working on our bathroom last weekend. Well, that just didn’t happen. After putting the testers on the wall, we’ve been at a standstill for two weeks. I’m not sure that is a bad thing though, because after two weeks of staring at the Glidden Testers on the wall, I realized I wanted to stick with my original plan. I almost changed my mind after seeing so many pretty colors and knowing that my husband was leaning toward the yellow. As much as I love bright colors, that just wasn’t my vision for our bathroom. We’ve been there, done that, and it doesn’t work in this room. Out of the four colors we tested, I liked the Summer Sandcastle most, but it looked almost white in the natural light. I headed back to Walmart and chose a color just a couple shades darker. It’s called Natural Linen and it’s from the Glidden Brilliance collection. Choosing a neutral and lighter paint color made all the difference. It took 2 coats to thoroughly cover the previous green. Justin, my husband, put one coat on and then worked on some other things while waiting on it to dry. I’d say it took less 2 hours before it was dry enough for coat #2. We were both impressed with the Glidden Brilliance collection and even more so impressed that you can buy quality paint at Walmart. I LOVE how this room feels now. I walk in and it’s like a breath of fresh air. The paint color really opened up the room. It feels fresh, crisp, and relaxing- exactly what I was going for. I’m glad we used the testers, because seeing them on the wall was the final push I needed to go with a neutral color. In addition to the new paint color, we also added a new hanging organizer over the door, new shower curtain (Who knew Steve Madden made shower curtains?) and a space-saver over the toilet. Why does my husband rock, you may ask. Well, I can take credit for the idea and the vision behind this room. I can even take credit for the shopping. But the work? Yep, that was ALL my husband. He worked the entire day to get this done for me and I’m so thankful to him. I really did want to help a little at least, but Bella had her 6 month shots AND her first tooth popped through, so you can take a guess at the kind of mood she’s been in. She didn’t want me out of her sight and refused to sleep. Justin acted like it was no problem and completed the entire room in about 8 hours! I revealed our bathroom on Facebook last night and I’ve actually had mixed reactions. A few people *gasp* liked the before. I bet they’d change their minds after living with it for almost two years, haha. Overall, folks like the after. What matters most? I LOVE the after. LOVE, LOVE, LOVE it. I can’t walk buy without sticking my head inside and admiring it. Bella approves and gives this room two thumbs up. I believe I heard her say this is the perfect room for her mama to relax while soaking in the tub. That’s my girl! Linking to The Shabby Nest, Fingerprints on the Fridge, and Tatertots & Jello. This project has been compensated as part of a social shopper insights study for Glidden Testers/Paint #collectivebias. Wow, what a differnce those things made. I love the new look! Such a beautiful bathroom! You really do have a beautiful home! the bathroom came out so good..i need ideals like this to make over my bathroom..great job. Where did you get the over the toilet storage cabinet?